Hi, I am interested in your 1979 Pontiac Firebird (stock #4896-CHA) listed on Autotrader for $38,995. I'd like to get more information about this vehicle and confirm its availability. 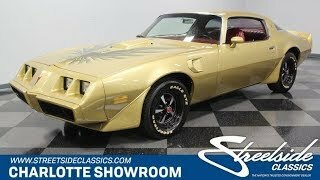 Take a moment to dig into the details on this 1979 Pontiac Firebird Trans Am. They took the time to restore this one right, so youll find a ton of upgraded components and even the right hints of originality like how the number-matching V8 was rebuilt for performance. The result is a stunning coupe that delivers everything you imagine a classic T/A can be. The stunning presentation starts with the paint. The gold makes this Trans Am akin to some of the special edition cars. But this is a more modern and deeper application that radiates with true precious metal authority every time the sunlight hits it. This generation has a particularly sporty look with the Endura front end, extra flare in the wheel arches, and a full-width rear spoiler. Plus, this performance attitude is turned up a notch with an extra hint of dark side. Not only does the grille and blacked-out rear panel look great against the gold, but the centers of the classic Rally II wheels were given a gloss black upgrade. And the perfect mix of this black and gold attitude comes together in the different shades of the famous hood bird that makes these T/As a drivers legend. Inside is an even bolder presentation with the upgrade to a red interior. There was a solid investment here, so the bucket seats, carpeting, door panels, dash, and much more all feel quite fresh. They even added nice upgrades like the AM/FM/CD stereo. The machined-turned metal panels are a great sporty touch that only the best Pontiacs got, and the return of the gold on the trim makes for a nice coordination with the exterior. You get all the best classic performance pieces like the grippy three-spoke sports steering wheel, full gauges, large speedo, and the unique tach/clock combo. One look in the engine bay, and you know youre going to want to show this one off. The tidy presentation and glossy gold fender walls are the kind of investments that make the bright motor look even better. Plus, they spent plenty rebuilding this numbers-matching 403 cubic-inch V8. The internals of the overhaul included a bored the engine, new pistons, full valve job, and a polished crank. Plus, they added a four-barrel carburetor, performance intake, MSD ignition, and ceramic coated headers that feed the sweet-sounding Borla dual exhaust. This is a coupe that youre going to want to show off everywhere, and so you have great driving features like a three-speed automatic transmission, power steering, and an aluminum radiator w/electric fan to help keep this running cool in all conditions. Add in front disc brakes, sway bars front & rear, and wide Goodyear Eagle GTII tires, and this is the right T/A for all occasions. Strong, powerful, and stunning, this is an upper-class Trans Am for someone who loves a distinct classic. Is that you? Call today!